Ghosts, Raina Telgemeier. 256 pages, 2016. As a fan of graphic novels in general, but a new fan of “all-ages” graphic novels in particular, I had seen Raina Telgemeier on all of the “best for school libraries” lists for a few years now. She’s won Eisner Awards (achievement in comic books), she’s in all the Scholastic Book Fairs – and yet, I hadn’t picked one up yet. In moving a shelf of books last week, I came across my copy of last year’s Ghosts again, and figured it was time to read it. About 45 minutes later, I was done…and in love. Ghosts follows Catrina and her family as they move to a cold, foggy Northern California town. She doesn’t want to be that moody teenager, but her back is up against the wall—she does not like Bahia de la Luna. She does like her younger sister Maya, and feels defensive of her. Maya has cystic fibrosis, and Catrina ends up her caregiver sometimes, and protector all the time. But is also a sibling, so…you know. It’s complicated. A cute neighbor boy takes the sisters on a “ghost tour,” showing them all the (wiggly fingers) spooooky places in town, and Catrina is unimpressed. Until they reach the ruins of an old mission, pop open some orange soda bottles, and…ghosts appear. A ring of ghosts, encircling the three kids. Delighting Maya, and terrifying Catrina. After the cold evening out, Maya’s CF worsens, and she ends up needing an oxygen tank and is in bed for much of the rest of the book. Catrina’s guilt and her fears about Maya’s death are a shadow over much of the book, but Telgemeier keeps things light enough that kids are going to keep reading. They want to know how the mystery of the ghosts resolves, and it does in a delightful way. We also see the traditions of the Day of the Dead celebration in Bahia de la Luna, and how culture and religion and tradition all interact to create a unique sense of place in the town. 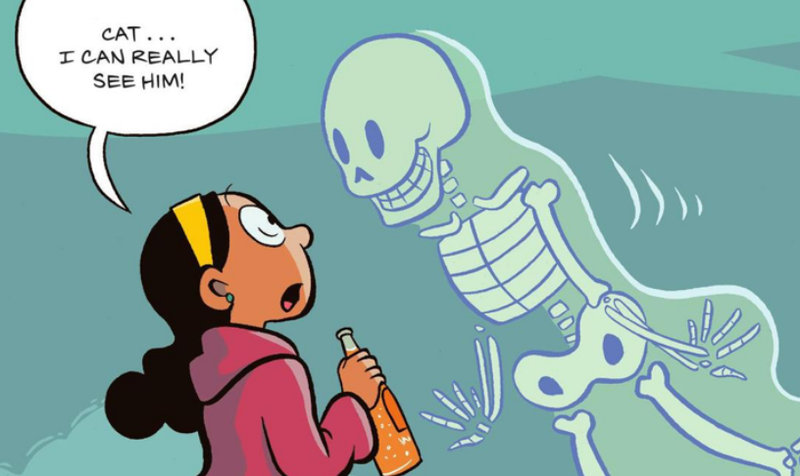 Catrina’s acceptance of her own fears about Maya, about losing her, are something that even adults struggle with, and they’re written (and drawn) beautifully here. 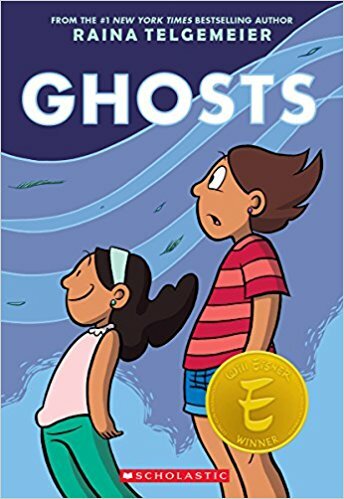 Where a prose book might be frightening following these same themes, Ghosts’ cartoony (but strong) illustrations keep things safe instead of horrific, sweet instead of harrowing. It’s just an outstanding read in every way. Now that I’ve met My First Telgemeier…I’ve got some catching up to do.